Through out southern British Columbia and Vancouver Island The center pin reel is dead giveaway to an avid Steelhead fanatic. Who else after all would fish with a reel that is quite honestly less efficient and more costly than a good quality level wind reel than an angler who has the Steelhead fever in a big way. Center pin reels have been with us for many years, in fact anglers were fishing in England over 100 hundred years ago with these reels. Why would an angler choose a reel that is more expensive and less efficient? Well the first reason is that the angler is looking to get everything possible from his or her day of fishing. You just cannot beat the feel you get from a center pin when you hook up on a fish. There are no gears to help you out, this is a one on one experience you feel every move that the fish makes. 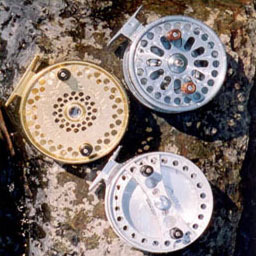 Center pin reels also lack a drag system; most are just equipped with a simple clicker much like a fly reel that can be engaged when a fish is hooked. When a fish runs you are the drag system you hand must palm the spool of the reel to keep the pressure on but not to tight or that loud snapping sound will be your line breaking, and that will be the last you get to see of that particular fish! For many anglers the attraction to these reels is there beauty. Center pin reels are pleasing to the eye. They are machined works of art and many anglers have become collectors of these reels with their collections attaining values in the thousands. There is also a certain amount of prestige involved in fishing a center pin reel, it says to the world that I am a committed angler and I will spend the money on my gear to prove it! Center Pin reels come in many styles and from many different manufactures. These reels can cost any where from about $250.00 to over $600.00 dollars depending on the model. When choosing a reel you must first decide where your budget is, as these reels are expensive. Center pins are all very similar they are a very simple design basically what we have here is a large fly reel with the ability to free spool line so we can cast and make drifts while fishing. Some center pin reels are equipped with bearings and some have a bushing drive. Bearing models are the most widely produced at present as they spin faster and longer right out of the box, however do not count out a good quality bushing reel. They may take longer to break in but once they do thy will run smooth as silk for years of use. Most center pin reels now come offered in a variety of anodized finishes this is a nice feature and enhances the look of your investment, black, gold and silver are the most popular. When many anglers are looking to purchase a center pin reel they often make the mistake of thinking that this is a reel that they can use for all of their river fishing. While you can use these reels in several different applications you will soon find out that center pin reels are for the most part designed for specialty situations, most common is float fishing in small to medium sized rivers. The main feature that makes a center pin reel so much fun to play fish is also its downfall as far as versatility is concerned. The one to one ratio you get from this reel is okay when you don't have to cast or retrieve a long distance, but if you are casting long distances all day a center pin will wear you out. Also you will not be able to cast as often thus making you less efficient in covering water and you will show less fish your bait. This is the reason that center pin reels are better suited for use on small and medium sized rivers. Sometimes in life, to move forward, we have to take a step backward in order to get a new perspective on our situation. Fishing with a center pin reel is much like this. There are dozens of modern reels on the market that will quite honestly outperform them. 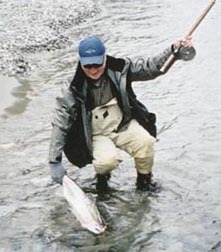 Yet if you visit our local rivers you will see many anglers fishing with center pin reels. For me a day on the river spent chasing steelhead is as much about how I fish for Steelhead as it is about catching Steelhead. In a days fishing you can certainly make a lot more casts with a level wind and cover a lot more water quicker. Fishing a center pin reel forces you to be more in touch with your gear and your surroundings. You cannot beat a center pin when you are hooked up on a good fish; it feels like you have a direct line, just you and the fish. Sometimes we can forget that fishing isn't always about the newest reel or the fastest retrieve ratio. Sometimes a few less casts with more attention to detail will catch the fish that others have overlooked. Fishing a center pin forces you to slow down and pay more attention to details, attention to detail is what separates consistently successful anglers from those who only catch the odd fish. Will a center pin help you catch more fish? Probably not, but the mind set that you have to adopt when fishing one certainly can. Because of this, fishing with a center pin reel is the approach that many anglers are looking to adopt for a day spent on the water chasing there favorite fish. While there are many different center pins available on the market both old and new, I have chosen three that I feel represent quality and value. All three reels are very functional and each has its own unique style and features. These reels are not rated as first to last but as individuals as each is an excellent example of the best that our marketplace has to offer. Retail prices are based on m.s.r.p. So this may vary in the marketplace. This center pin reel is the least expensive of our trio. The Ruston retails for around $250.00. This is an excellent reel for an angler looking to buy their first center pin. This reel is both well made and attractive. The spool is bearing mounted and is 4.25 inches in diameter and has plenty of line capacity for any application. This reel is anodized in a light steel blue color with wood handles. The Ruston also comes with a neoprene reel pouch. This is functional, affordable and very pleasing reel to look at and fish with a very good choice for any angler. This reel is definatly the Hi Tec option. The Vectra SST come to us from back east and the great lakes steelhead fishery. 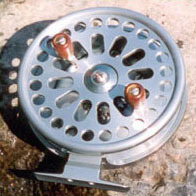 This reel has a unique 4.5-inch large arbor design bearing mounted spool. The Vectra SST is also designed for use with left hand retrieve, finally a reel designed for all you lefties out there. 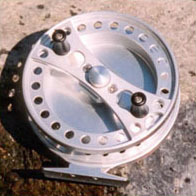 The Vectra SST is one of the most attractive and unique reels on the market today. Silver, black and gold anodized finishes are all available, this reel retails for around $425.00 and is and excellent choice for the angler looking for a modern Hi Tec quality center pin. When you hear about Islander reels you expect premium quality, the Islander Steelheader is no exception. This is one of the most popular and prestigious center pin reels on the market today. The Steelheader is available in gold or black and has a bearing mounted 4.5-inch diameter spool and comes with a rugged neoprene pouch. This reel is beautifully balanced and extremely well finished. 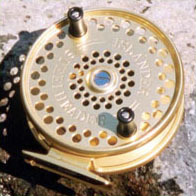 The Islander Steelheader reel retails for about $400.00 and is a classic example of a fine center pin reel.